Ever since R and I went out to eat at the Indian restaurant a couple weeks ago, I have been craving curry like nobody's business. Although it was no where NEAR as good as restaurant quality, it was still pretty darn tasty, and super easy. On most days, that's good enough for me. 2 cups chopped vegetables of choice. I used potatoes, zucchini, yellow squash and carrots. In a large dutch oven or other oven/stovetop proof dish, heat approximately 1 tablespoon of olive oil over medium heat, then add the onion and chicken. Season the onion/chicken mixture with salt and pepper, then stir until the onion is softened. In a small bowl, stir curry powder into the coconut milk. 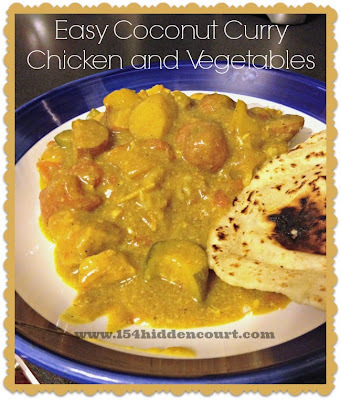 Add the vegetables to the chicken mixture, pour the coconut milk and curry powder over all of it, and place in your oven. Cook approximately 45 minutes, stirring occasionally, or until it reaches your preferred consistency.